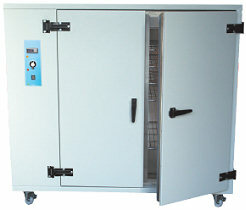 The GENLAB Large Capacity Multipurpose Incubators offer a unique range of highly efficient, reliable and accurate units suitable for much larger applications in incubation, research and general laboratory applications. Heated by Incoloy sheathed elements positioned in the base fan duct for units up to 650 litres and in the side fan duct on units 650 litres and over. All units have as standard a PID Microprocessor controller with dual displays of set point and actual temperature that are auto-tuned to each individual unit to optimise the heat up, overshoot and control of temperature. 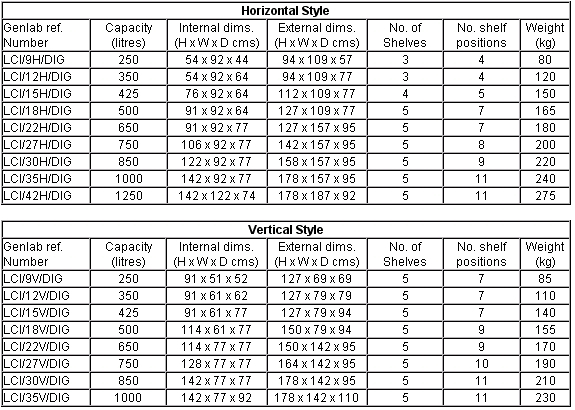 The horizontal style incubators in this range are the LCI/9H/DIG, LCI/12H/DIG, LCI/15H/DIG, LCI/18H/DIG, LCI/22H/DIG, LCI/27H/DIG, LCI/30H/DIG, LCI/35H/DIG and LCI/42H/DIG. The verticle style incubators in this range are the LCI/9V/DIG, LCI/12V/DIG, LCI/15V/DIG, LCI/18V/DIG, LCI/22V/DIG, LCI/27V/DIG, LCI/30V/DIG and LCI/35V/DIG. All units have CLAD interior with microprocessor digital control as standard.